Botanical name: Bixa Orellana L.
In today's blog, I am so happy to share my pictures of shrub-like tree called Sindur or Sindure tree of Nepal - not only because the tree and its fruit look so exotic-beautiful-ornamental, but has a deeper religious significance and special meaning in Nepali culture. 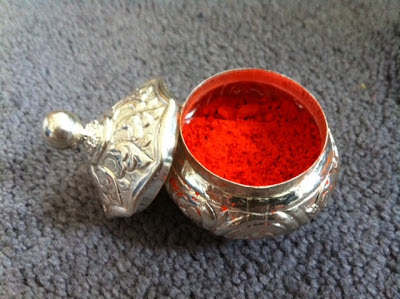 Sindur or Sindoor is an important auspicious red vermillion powder that is used in many Nepali religious rituals while worshiping gods. Most importantly, in Nepali Hindu wedding rituals, "sindur halne" (सिउदो मा सिन्दूर हाल्ने) is the tradition of applying sindur powder (vermillion) in the bride's upper forehead and parting line of the hair by the groom. This signifies acceptance of an eternal partner in life. This ritual is considered extremely auspicious and has been carried on for centuries. Once married, many Nepali Hindu woman will wear sindur on a daily basis for husband's longevity and security. Sindur is a mark of a married woman in Hinduism. Single woman do not wear sindur in the hair, but wear a dot on the forehead. Most of the sindur that are found in the market these days are made of synthetic dyes and chemicals. The sindur tree here in the picture is a sacred symbol of purity. The elderly local villager told me that the pulp that is surrounding the seeds are made into pure natural sindur. During the auspicious dates for marriage to be performed (vedic tradition suggests certain auspicious dates), people come from all over to obtain the real natural form of sindur. He also added that these days, many Nepalese prefer to buy commercial manufactured sindur rather than the natural form because it is convenient and also everyone does not have easy access to the tree. The picture of sindur tree were captured in Pitaunji area - although Pitaunji may not look like a tourist destinations to many visitors, but this is the place where I first saw the Sindur Tree of Nepal. Pitaunji is a sleepy little farming village tucked in the Nawalparasi area of Mukundpur, on the way to Gorkha Brewery Pvt. Ltd. I have many fond memories of spending several winter days with my always-cheerful friend, Pratima, and her farmhouse in Nawalparasi. We love the rustic tradition of country life and enjoy strolling around the meadows, farm lands and watch the beauty of surrounding Narayani River. One late afternoon, I was busy capturing the images of the area and a local village boy came and asked me, "sindur ko rukh dekhnu bayako cha?" (translation - have you ever seen Sindur tree of Nepal?). No, I have never seen such a tree or even heard about sindur tree. I thought sindur, (vermillion powder) that we use in the modern days came from a mixture of some chemicals. The village boy took us to see the place where the sindur tree was in bloom. I was fascinated to see the tree and its fruits; photographing it was the highlight of my day. I would like to thank Asha for providing me a welcome snapshot of sindur tree in her area across the street. Come along with me to explore more Nepali culture, a day in the country, simplicity of life and having fun in the meantime...and let the Sindur tree tell you the pictorial story..... I am happy to share the pictures of this attractive tree with its brilliant red fruits for my blog readers. My thank also goes to Dr. Narayan Prasad Manandhar, the author of "Plant and People of Nepal" for identifying the plant, and providing me with the botanical name, when I sent him the enclosed pictures. Here is the link to his book available through Amazon. He has spent decades in a firsthand study of the riches of Nepal's flora and the human uses thereof. He has conducted field research (on foot) in all 75 districts of Nepal in a lifelong effort to record the utilization of plants for food and medicine as well as diverse other applications. More than 800 drawings by the author illustrate the text..... continue reading, click here. "The red powder surrounding the seed is used on the forehead of a woman, signifying her status as married, just as the vermillion powder (sindur in Nepali) does for other Hindu woman. Pulp of the seed is also used to color oil & butter, and to dye clothes. Women in villages used the pulp for cosmetic dyeing of their hands." ...small evergreen tree with bright maroon-red heart shaped fruits, when ripe the fruit splits open revealing orange-red pulp and seeds. Here are some informative links about sindur tree (Bixa Orellana L.), please check the following links here, here, here. The village boy breaks open the fruit exposing orange-red pulp and the seeds - roughly each capsules have more than 50 seeds. The pigment that is derived from the seed will color anything that it touches. It is used as a natural coloring agent for food, used in fabric dye, body painting, in cosmetics, and many other industrial dye. The fruits are harvested before they start to turn brown and capsules split open. The seeds are collected and dried in the open air, cleaned and processed. A beautifully carved, traditional Nepali Sindur box (सिन्दूर को बट्टा) is given to the bride by the groom during wedding ceremony - photo courtesy - to read more about traditional Nepali wedding, please check this wonderful and informative blog - view all posts under weddings - "Musings from an American-Nepali Household". The auspicious silver box, sindur ko batta, has a special significance on Nepali married women. The box and the sindur powder is always carefully kept inside the red brocade pouch for a sacred keepsake. Married women believe that the sindur will give life-long protection to them and longevity to their husband. The above two images - showing the method of applying sindur powder (vermillion) in a traditional Nepali Hindu wedding ceremony - the groom is applying the "सिन्दूर" to the bride's seudoo (सिउदो) which is a parting line of the bride's hair and the upper part of the forehead. In Nepali custom, several woman assist holding a holy and auspicious fabric next to bride's forehead, and the groom starts to sprinkle the sindoor in a line until he reaches to the forehead of the bride (सिउदो मा सिन्दूर हालेको). 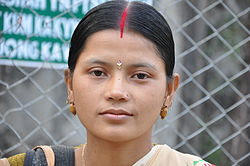 Woman wearing Sindoor (सिन्दूर) - photo courtesy - It is a traditional red or orange-red colored cosmetic powder, usually worn by married women along the parting of their hair. Usage of sindoor denotes that a woman is married in many Hindu communities, and ceasing to wear it usually implies widowhood. The main component of traditional sindoor is usually vermilion. If you have any expertise or knowledge you want to share with us about the Sindur Tree of Nepal, please write in the comment section of the blog. Thank you. Wow! never knew something like Sindure (Sindoor Tree) existed before reading this post. Infact, never a thought crossed my mind about how sindoor is made or produced. Thanks for this not-very-well-known fact. I am definitely going to spread this with my friends and family. Thanks Jyotiji for the info on Sindur tree. I have brought some saplings from Raipur (C.G., India) and planting them around various Hanuman Mandirs in Nagpur. This sindur is also used as 'Chola' or 'Tambe Shendur' as called in Marathi to colour Hanuman Bhagwan idols. Bhagwan Hanuman is my Kuldevata and he is known to like this chola a lot. Sindur is also used for Tantrik practices. Thank you mrityunjay Tripathi...I really appreciate you taking time to comment and giving additional information about Sindur Tree. Sending you Namaskar! Thank you Jil Walters for commenting...hope you will keep checking my new entries! me and my friend plant this tree in his farm but we didn't know how can we got sindoor, but from this perfect information we can know from where we got Sindoor now. Also if possible please update until how old tree got this type seeds. We are very thankful that we got this information. Also now we can offer this original thing to our god. I have never planted the tree, but the village people of Nepal tell me that the tree usually bears fruit within 1-2 years from seed or planting. Thank you Daivagya Maharishi and Namaskar - I am so glad that you came across my blog and found the information useful. I will try to post more information on Sindur tree of Nepal, whenever it is available to me. Hello there, good blog. I saw a 'sindoori' (bixa orellana) tree today and was intrigued as to its characteristics and your page did not disappoint. However, I did find some more information which you may be interested to know- the tree is native to south America, and like many other species was introduced by the Europeans to Asia in the 17th century. Historically, sindoori (vermilion) has been made from the rare and rather toxic mercury oxide ore. Thank you for the helpful information. Please stop by again to check out my new entries. Today I myself saw its fruit first time and was amazed -for details I searched net and found this post -Thanks for giving details of sindoor tree and its fruits! can u provide me Kamiya sindur. Sindoor flower at Habra in West Bengal, India. Jyoti tapai ko blog nikai ramro raichha ! i want this sindur in bulk quantity. please contact me for this. I have seen the Sindhur trees (at least 10-12) in some villages in Western Ghats. I have brought a few fruits, too. Could you please post more details about how to process Sindhur powder from the fruits? I have planted sindur at my home about 1 year ago. May i know how much time take it getting flowers on it? Great trick of making sindoor thanks for shairng these details. Here i am sharing beatuiful Handmade Kumkum Sindoor Box. You can esaily buy this. Great post! But please don't say the "main part of traditional Sindoor (Sindur) is Vermilion". Vermillion is from an oxide called Cinnabar - which is known to cause Cancer. The Europeans who came to India called Sindoor colour Vermillion because it is similar to the Vermillion colour of the European paintings. But they are not the same. Sindoor from trees is natural and not dangerous. However nowadays the Sindoor we can buy in the market sometimes has Vermillion from Cinnabar the dangerous chemical and the even more dangerous Lead Oxide, so it is always best to use the Sindoor from the tree.